Saint Monica on Verse Daily. Equally familiar and strange in her wonderment, Mary Biddinger’s Saint Monica rises above the water towers and smokestacks of the midwest, a saint transfigured into a modern girl with a persistent craving for muscle cars and tattooed love boys. Yet this Saint Monica does more than want; her yearnings are feral, carnal, and unflinchingly honest. She does not ask for God to take her walls away so much as figure out how to kick them down herself. The result: her escape route is illuminated by a slender and elegant beam of longing and melancholy in poems that make clear the clandestine nature of what we desire most. 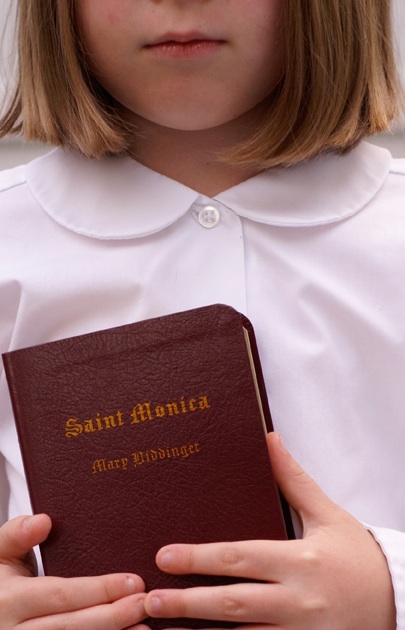 Mary Biddinger evokes the patron saint of female abuse victims in narrating the adolescence of a latter day Saint Monica. Ironic humor illuminates the poems, as in “Saint Monica Stays the Course,” a hilarious catechism of teeth-gritting endurance. Biddinger crisply narrates these memorable tales that entwine horror and sensual discovery, using deft rhythms, head-snapping line breaks, and highly original imagery.